This post has 2,772 views. Recently I went a trip with a few travel buddies to Acadia National Park in Maine. We had a pretty good time, and this post contains some photos and highlights of the trip. This was probably the last long-ish vacation trip I’ll have for a while, since I’ll be starting work soon. Yes, I did finally find a job, but I’ll leave that for another post. I’ve been wanting to go to Maine and Acadia National Park for a while, since Acadia is the only national park in the Northeast. I went with a couple of friends and friends of friends. Since we had a group of people, we rented a vacation home in the area. We didn’t get a place with an ocean view, but the place was decent enough, and renting a single house was more affordable than getting several hotel rooms. Located on the coast of Maine, Acadia National Park is comprised of three separate areas, with the main area being on Mount Desert Island and also areas on the Schoodic Peninsula and Isle au Haut. The main attractions of the park are the rugged coastline, and the mountains and hills in the park that provide great hiking trails and scenery of the forest, the coast and the Atlantic Ocean. There are also a bunch of fishing villages/towns in the area that provide accommodation, activities and food, in particular lobsters. People waiting for the thunder at Thunder Hole. A pretty good shot to show off the rugged coastline as well. A wave crashes into Thunder Hole for a nice boom. 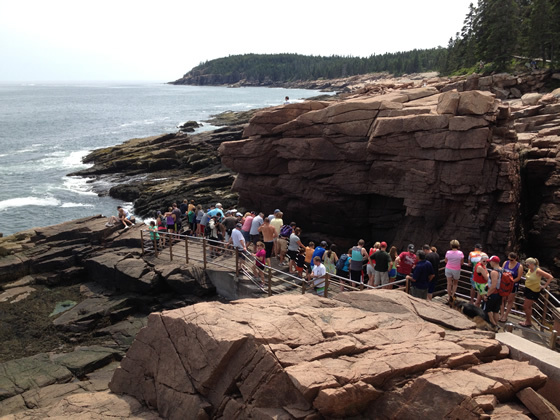 Since it is the only national park in Northeast, Acadia tends to be pretty busy in the summer. There were quite a few people, but we didn’t find traffic or parking to be a problem when we visited. In terms of area, Acadia is not that big for a national park, but there are plenty of things to do within park grounds. The most obvious thing for first time visitors like us is to go around the park loop road on the eastern half of Mount Desert Island. The loop road provides convenient access to some of the park’s most notable attractions. 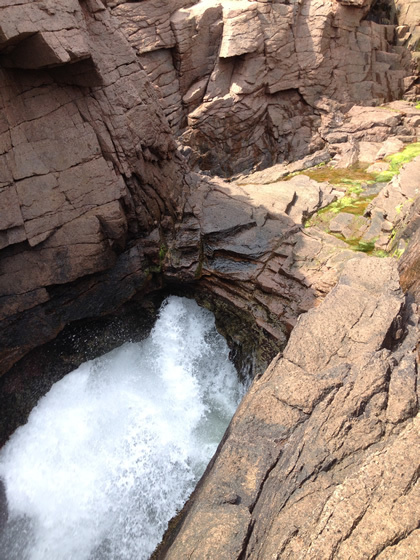 We stopped by Thunder Hole and Otter Cliffs to have a look at the coast. The coast in the park is very rugged and rocky, with a lot of the rock being the pink granite that is characteristic of the area. It doesn’t look as serene as a white sand beach, but the rugged Maine coast is beautiful in its own way. 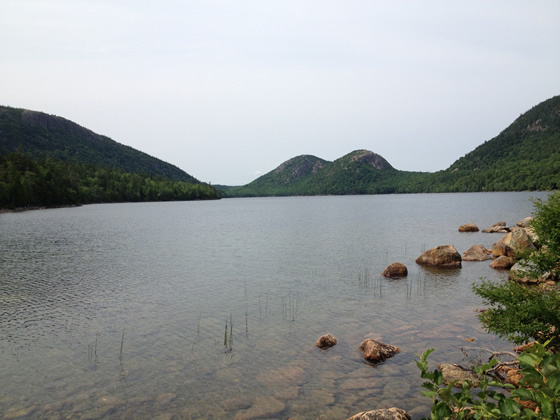 Jordan Pond and the interesting Bubble hills at its north end. After the coast, we rounded up the loop road to visit Jordan Pond which provides the drinking water in the surrounding area. Then we headed up a side road to summit of Cadillac Mountain, which is the tallest mountain in the park and on the Atlantic coast of the United States. The top of the mountain also had a lot of exposed pink granite. The top is relatively flat, so it’s easy to explore the summit area. The mountain has an elevation of only 470 meters/1528 feet, but the view on top is quite expansive because it’s the tallest peak in the area and it’s near the ocean. 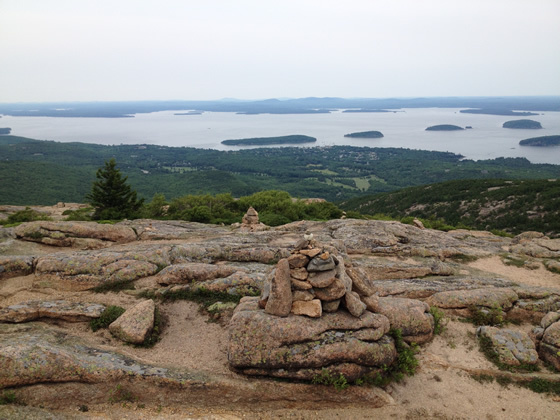 From the top of Cadillac Mountain, one can get a 360 degree view of the surrounding area. In addition to being the tallest mountain on the Atlantic coast, Cadillac Mountain is also well-known for its sunrise, as its location in Maine means that the mountain sees one of the earliest sunrises in the US. Some people within our travel group did go to see the famous sunrise, but I slept in because I didn’t feel like getting up at 3 o’clock in the morning. The east side of Mount Desert Island is the busiest area in Acadia, but Acadia has plenty more to offer. We visited a few locations on the western half of Mount Desert Island, and there were fewer people around compared to the eastern side. I liked it this way since I go to national parks to enjoy the natural scenery without a crowd. Our main activity on the west side was to hike the loop on Acadia Mountain. Acadia Mountain is not the tallest mountain nor does it offer the most exciting and daring route (that honor goes to the Precipice and the Beehive), but nonetheless the mountain features some great views at the top and an interesting, challenging, but not overly long trail loop. Hiking Acadia mountain requires the use of hands and a little bit of rock scrambling at a few spots, but it’s nothing a couple of healthy young adults can’t handle. The trek to the top leads to open areas where one can get a spectacular view of Somes Sound and also surrounding hills and mountains on Mount Desert Island. 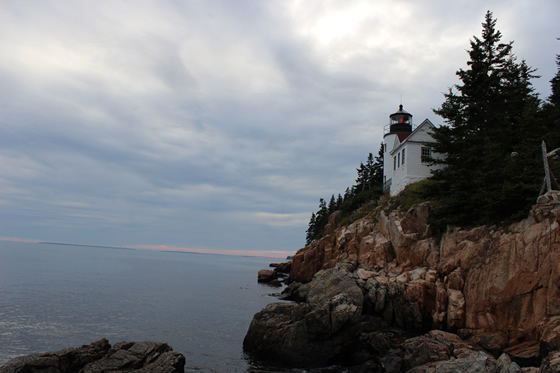 The view of Bass Harbor Light from the classic angle. Also located at the southern tip of the western half of Mount Desert Island lies the Bass Harbor Head Lighthouse. Bass Harbor Light is probably one of the most iconic sights of Acadia National Park, and you’ll see its image on postcards and promotional material for the park. To get the classic vantage point to view the lighthouse from east towards the west, we had to climb down to the coast and scramble over some granite boulders. On a nice day, you’ll see photographers at the location waiting to catch the lighthouse with the sunset, but we didn’t stay for that long since it was cloudy. 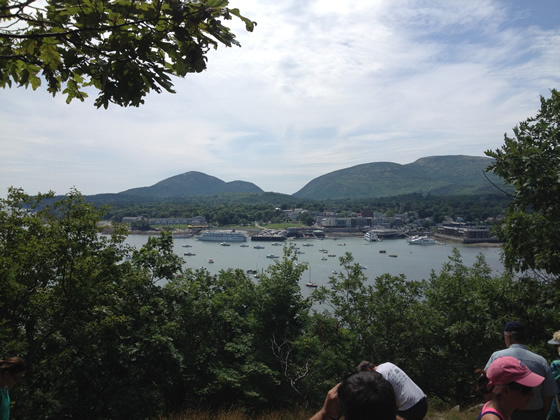 The view north from Agamont Park in Bar Harbor. Other than enjoying the park grounds on Mount Desert Island, we also visited some of the communities on the island. 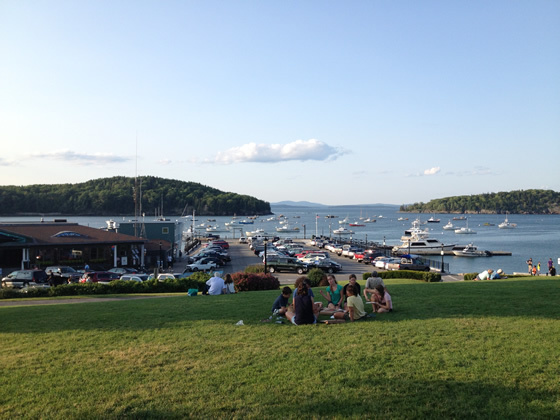 The town of Bar Harbor on the northeast corner is the main tourist hub with its hotels, shops and restaurants. Right to east of Bar Harbor is a small island called Bar Island which is accessible by walking during low tide. We took the short walk to the island, and also spent some time exploring the sandbar path to the island. We found a few shore crabs underneath the rocks, and a friend even dug up some clams. 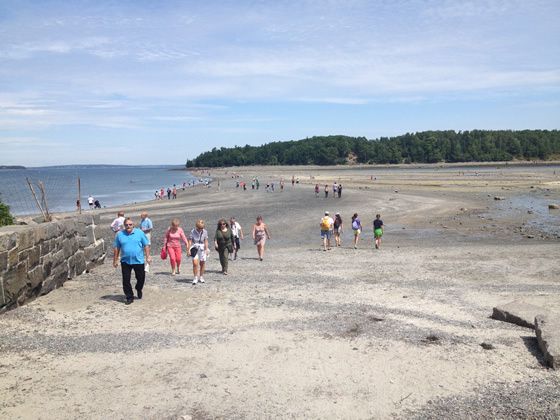 People walking over to Bar Island during low tide. 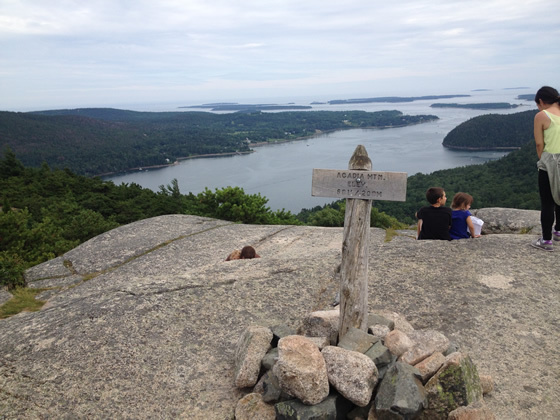 As mentioned before, Mount Desert Island is not the only area of Acadia National Park. While we didn’t visit Isle au Haut because it was further and required a ferry to visit, we did visit the Schoodic Peninsula to the east of Mount Desert Island. 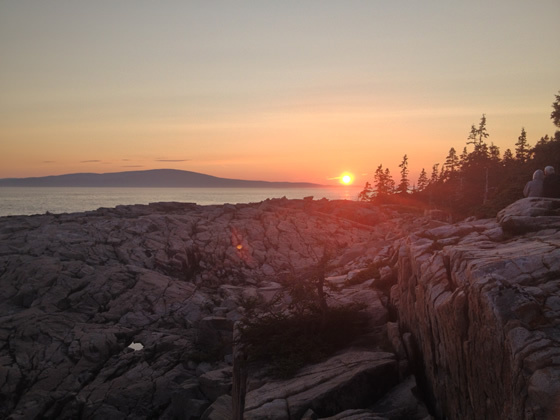 The Schoodic Pensiula is a relatively small area, but it still offers the rugged, rocky Maine coastline and one or two nice hiking trails through the forest. We hiked up to Schoodic Head, the high point of the area and got some pretty good views of the seas and nearby small islands. My group also decided to view both the sunset and sunrise at Schoodic Point, and they were pretty nice. While I declined to go view the sunrise at Cadillac Mountain, I went to Schoodic Point because it was closer to our rental house. Pretty good view of the ocean from Schoodic Head. That’s about all the things we did inside Acadia National Park, but that’s not all for this post. 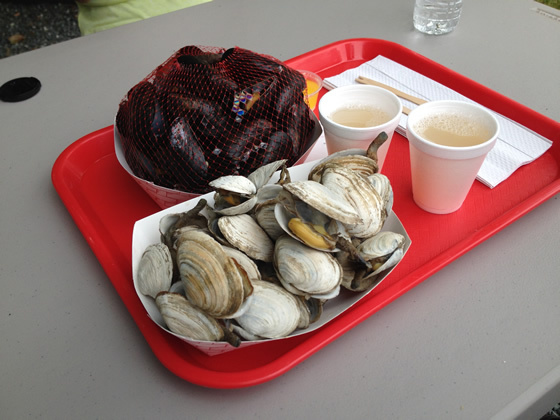 One can’t visit Maine without having seafood, especially the renowned Maine lobsters. We had lobster every single day during our trip, in the form of the classic boiled lobster and the lobster roll, which is lobster meat with mayo on a roll (bread). Fresh lobster is very delicious in both forms. Eating lobster rolls was less work, but breaking open the boiled lobster is an experience onto itself. I had both hard shell and soft (new) shell lobsters. Hard shell lobsters have more meat per pound, but they are more expensive and take longer to crack open. In comparison, soft shells have less meat per pound but are cheaper and can be eaten without a shell cracker. Both tasted great. I found the lobster fare to be less expensive in Maine than other places as expected, but it’s not going to be super cheap. 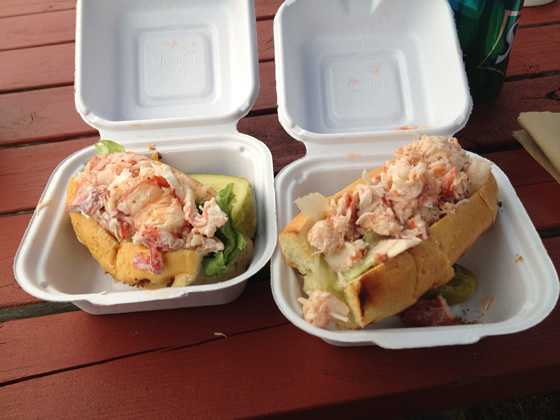 Aside from one place that offered 2 lobster rolls for $10, most of my meals cost about $20-25 when there was lobster. A tip to fellow travelers is that the lobster pounds in the area tend to close early at around 8-8:30 PM. 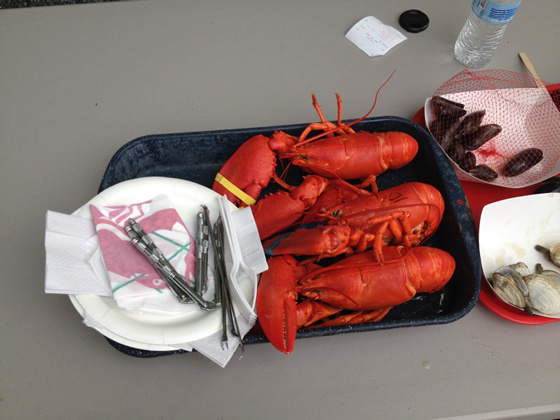 We didn’t know when we first arrived and had to get takeout boiled lobster and hastily eat it outdoors. That turned out to be not such a great idea as I was bitten by mosquitoes about 20 times all over because I forgot to put on bug repellent. For the rest of the trip I used bug repellent liberally, and was bitten only once more. 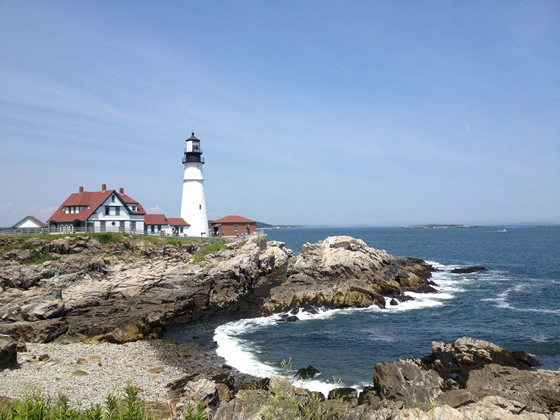 The last thing to mention about the trip is that on our way back, we stopped by Fort Williams Park in Cape Elizabeth to visit Portland Head Lighthouse. Portland Head Light is listed by many publications as one of the most picturesque lighthouses in the US, and so we had to take a look. We went there on a beautiful sunny day, and the view of Portland Head Light was as picturesque as all of the photos that you’ll find online. The location of the lighthouse, and the rocks and cliffs on the shore made it easy to snap some postcard-worthy photos. The scenic Portland Head Light at Cape Elizabeth, ME. 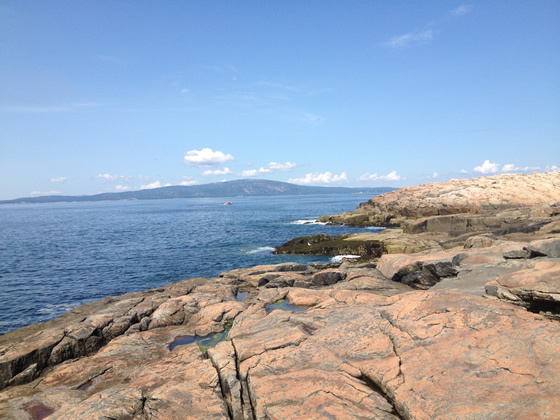 I enjoyed our trip to Maine and Acadia National Park, and it was good to check off another entry on my list of places to visit. Since I’ll be starting work soon, I probably won’t have time to go on another trip for a while.